Look at all those lines! This part is painted, but you can't tell yet, from the angle. That's a wonderful, heavy duty roll-out awning over the doors. Because we have so much wind here, we can't have an umbrella, and have to roll this awning in and out. It gives us an entire additional living space in nice weather. THAT's why I insisted this deck get painted. I worked 3 hours after my OTHER WORK! yesterday, while our helper started earlier in the day. Whew, I am not tall enough to reach the top of those boards! Our helper John offered to do the fiddly parts with the brush if I did the larger roller areas. Sounded like a great plan to me! I was getting a bit shakey, (Hey I've been a Senior Citizen for years!) and light headed at the end. This was around the corner of the house/deck, and if I kerplunked down to the ground due to fatigue or a heart attack or ?? ?, no one would find me for a while, so I decided I'd better quit. At this point even taking a shower took too much effort. Sighhhh, one more afternoon and it will be DONE. Due to excessive fatigue, and looking forward to finishing this painting job, and looking forward to actually sitting on the deck before winter comes, and then planning the next project, and, and and ... not a normal sleeping pattern for me but, I was awake most of the night, drinking, hot flashes, getting more water, too hot, too cold, where are the blankets, my hip hurts, DH was fidgeting, etc., so I finally got up and started sewing at 4:00 am! I am expecting to crash today or tomorrow! These blocks are going to need 'something' to help pull them together. Putting them on point will allow me to use side setting triangles in a PLAIN cream, that should calm it. There are a couple prints that I cringe each time I see them, so have decided to "File 13" them. Out they go! Your painting project looks great and I completely understand the senior citizen status and limitations. I am trying to space physical projects out so that I have some real time to recover (and I get little help with them: DH is not a project person). You are definitely right to take it easy - I don't think I could have lasted as long as you did. I usually feel faint when I am hungry. Your quilt is coming along quite nicely. That scrappy quilt is really eye-catching. I love the pattern and the secondary pattern, and your fabrics look great together. 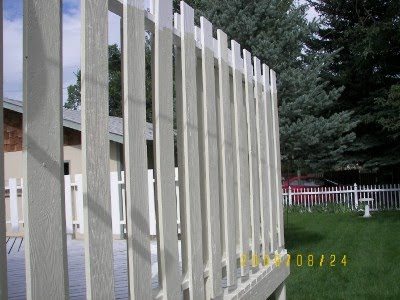 I'm not commenting on the fence painting -- the thought of it just makes me ache! Beautiful quilt. I love this pattern! I have a feeling I am going to make it in every colorway I can! I did that with the Strip Twist pattern. I made one in pinks, blues, purples, greens, browns and a totally scrappy one. Isn't Bonnie's pre-cutting system great? Love it! Take it easy. I want one of those awnings for my front door. It must be the weather because I was awake at 4 AM too. It can't be old age! Lol. I like the quilt a lot. Oh Elaine, whew, what an effort it sounds like. The way you described it though, kerplunking and all, really brought me into the moment. I thought I was with you and could really relate. Then the shower, too. Uh. And finally to be hit with what I sometimes call overtired is just another ker on the old plunker. I do love your blocks, continue to imagine you enjoying the creation of them and look forward to the plan for on point. Fantastic. Go for you to face up to File 13. I do that sometimes to although I don't think I've ever admitted it. You rock, Elaine. After you finish all that painting you should treat yourself to a day at a spa....massage....soft music...nails done. :) You deserve it!!! Elaine, your deck is lookin' good... but please do be careful not to overdo. How great to have someone to help with high stuff and the fiddly parts. I like the scrappy star pattern, too. I'm de-constructing old shirts, hoping I'll end up with enough fabric to do a bed size. I'm thinkin' probly not, tho. What to do. You are really going to enjoy that deck once you get it all spiffed up! Awnings are very practical for keeping the sun out too - in Austria our 5th floor condo has awnings that crank out in the summer. We also have something like hurricane blinds that we crank down after dark in the winter to keep the warm IN. I want cranking awnings on all my south facing windows here. Love them! Good job on your blocks. 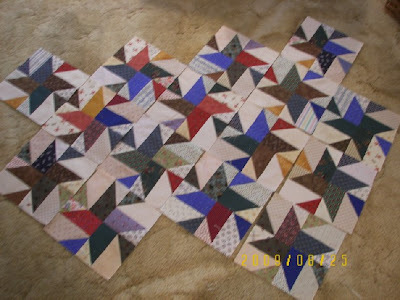 I just love making blocks - it is the setting of them together into quilts that slows me down! Oh, but it will be such a gorgeous quilt! Don't overdo the painting (though it does look great!) Andything that might disrupt your sewing should be taken slowly!!! Love, love your scrappy wonderful quilt. I must make one of those too. Now look here, Elaine, do not over do it out in the heat! This block has always looked awkward to me--I love the construction and the pattern, it just looked odd in a quilt to me--by putting it on point, you have taken care of that. Watch for me to copy you soon! The deck looks very nice. I love the quilt!!! Sometimes it feels good to drop the oh so ugly into the trash! Oh that blue/purple is very bright. I think you need to add some bright yellow and orange to balance it! It will be wonderful! Sounds like John has turned into a life saver! 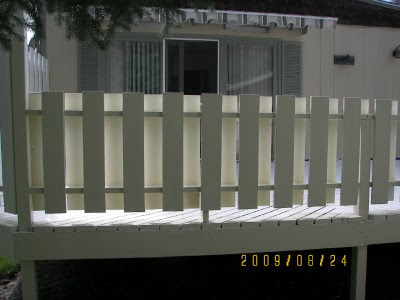 Your deck and rails are looking great! You will enjoy relaxing out there soon! Word Verification, acepto - Spanish for accepting responsibility. Well -- I'll be darned! Ya need to have faith!